At South Calgary Periodontal Group, we believe that clarity is the key to a good and respectful relationship. In an effort to ensure that your next periodontal appointment is as pleasant and as predictable as possible, we would like to give you an overview of our appointment and office policies. Please feel free to call us at (403) 278-5446 with any questions you may have. Please understand that it is your responsibility to keep track of your upcoming periodontal appointment. As a courtesy, we send out reminder cards or emails to you four weeks prior to a requested appointment and make confirmation calls or emails two weeks prior to hygiene appointments. As well, we send a courtesy reminder the day before for all appointments. We will make every effort to contact you prior to any appointment, however, it is ultimately your responsibility to ensure that you will be at your appointment unless other arrangements have been made in advance with our office. Due to continuous high demand in prime appointment times, we require a minimum of two business days’ notice per appointment should you need to reschedule or cancel your appointment. Because we value your time, we do not double request our clients. As such, your appointment is valuable time that the doctor has reserved specifically for you. In any case, where insufficient notice is given, a missed appointment fee may be charged to you, or we may require you to prepay to reserve your next appointment. 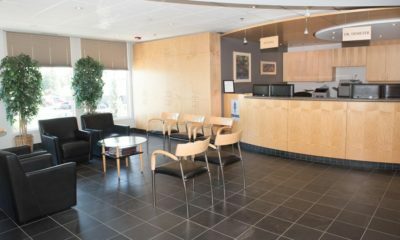 At South Calgary Periodontal, our goal is for you to have a pleasant experience in our office. We strive to serve you to the best of our ability in helping you attain a high level of dental and overall well-being. If you have any questions about any of these policies, please do not hesitate to call us at (403) 278-5446, or email us at info@southcalgaryperio.ca.